Designed for transporting equipment and supplies, this mobile cart is constructed of solid oak with heavy-duty steel corner braces. 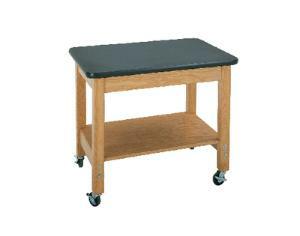 Cart includes one auxiliary plywood shelf and leg stretchers for extra space and storage. Four swivel wheels with casters and brakes allow for safe and smooth movement throughout the lab. Choose between a plastic laminate or ChemGuard top. Size: 36” x 24” x 30”.